MONTANA IS OUR HOME AND WALLEYE FISHING IS OUR GAME. Montana is called Big Sky Country by most, but when you talk to Dale or Jim, they call it “Big Walleye Country.” Dale and Jim have fished walleye from Arkansas to Canada and Michigan to Montana and will tell you that Montana has some of the best walleye fishing in the country. If you don’t believe it, just talk to anyone who has stalked the monsters of the Missouri River system as it flows through Montana. The mighty Missouri River offers several outstanding opportunities for walleye and sauger fishing at various times throughout the year, beginning with Canyon Ferry Reservoir near Townsend. Canyon Ferry is the first reservoir created by a series of dams on the Missouri River. This system has trout, a good number of walleyes and some trophy-class fish. Downstream from Canyon Ferry, is Hauser Reservoir and then Holter Reservoir. Holter is one of the most scenic fisheries in the state with over 20 miles from the dam to the Gates of the Mountains. Lewis and Clark traveled these waters over 200 years ago and marveled at the beauty in their journals. The same breath-taking views through the canyons and Little Belt Mountains are still here for you to enjoy. You can catch nice trout and walleye and frequently see mountain sheep, bald eagles, or mountain goats while fishing. Holter has a slot limit on walleyes so there are fish of all sizes with another a great opportunity for the catch of a lifetime. And don’t tell anyone, but the Missouri River as it flows past Dale’s town of Ulm and downstream of Great Falls is top-notch water for walleyes and sauger, too. It also produces trophy-class fish that anglers in most other parts of walleye country can only dream about. Then there’s the big water of 132-mile long Fort Peck Reservoir which produces countless 10-pounders for anglers over the course of the year. 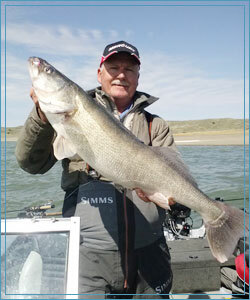 Fort Peck produces some fabulous fishing with numerous 4# plus small-mouth, and large northern pike as well. Completely surrounded by the sprawling C.M. Russell National Wildlife Refuge, it’s almost a wilderness experience when you explore its far reaches. And don’t forget some of the smaller reservoirs like Lake Frances, Tiber Reservoir, and Fresno Reservoir. All of them provide great places to fish for walleyes, too. Historically these systems have good numbers of eating-sized fish, although Tiber currently holds the state record walleye so they do have a few good fish too. Simply put, Montana is a very good place to fish for walleyes, sauger and saugeye. In fact, the state lays claim to the world record saugeye, at 15.66 pounds, caught by Myron Kibler and the co-world record sauger, at 8.805 pounds, caught by Gene Moore, both out of Fort Peck Reservoir. The state record walleye, at 17.75 pounds, was caught by Bob Hart, out of Tiber Reservoir in 2007. The big draw isn’t just the size of the fish you can catch. It’s the fact that you can still find wide-open spaces and either short lines or, more likely, no lines at all at the boat ramps. There is plenty of room to park your rig! It’s a place you can get away from it all and simply enjoy fishing. Captain Dale is really excited about Captain Jim Muzynoski of Bozeman joining the MontanaWalleye.com website and the contributions Captain Jim will be making to the site. Two heads are always better than one and with Dale and Jim (“Team Walleye”) sharing information and working together you will get the best information and fishing experience you can get. 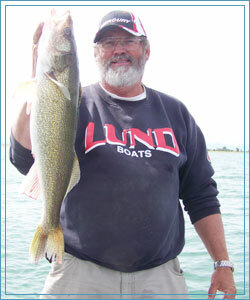 The Captains have also teamed up this year to offer the “Captains Weekend Walleye Boot Camps”. “Team Walleye” collectively brings over 70 years of experience fishing for walleyes, have proven records of success and are willing to share what they have learned and will teach you how to find and catch fish. Let’s go fishing and have an experience of a lifetime. You’ll learn all about it as you explore our website. We’re glad you stopped by to visit. We hope you come back often to check out our fishing reports, photo gallery, catch up on the latest articles and, most of all, learn why walleye fishing is so much fun. Best of luck out on the waters. Casual, comfortable athletic clothing, water shoes, hat and light jacket. Since 1977 Montana River Outfitters prides itself in offering only the finest river trips available.